and the tomb becomes a ladder to heaven. Rejoice, Gethsemane, holy shrine of the Theotokos! and today thou hast passed from earth to heaven. Thy glory is full of splendour, shining with grace in divine brightness. Virgins, be raised to the heights with the Mother of the King! the Cherubim and fearsome Seraphim, glorify thy falling asleep. adorned with honour by thy divine glory. (Tone 1) By the divine command the God-bearing Apostles were caught up by clouds from every place. (Tone 5)When they came to thine all-pure body, the source of Life, they kissed it most reverently. (Tone 2)The highest Powers of heaven were also present with their Master,(Tone 6)and, seized with awe, they escorted the inviolate body, the body that had received God in the flesh. In a manner beyond this world they went before it and invisibly cried out to the ranks above them: “Behold, the Queen of all and Child of God has come! (Tone 3) Lift up your gates, and in a manner beyond this world receive the Mother of the everlasting Light, (Tone 7) for through her was accomplished the salvation of all the mortal race! We cannot gaze upon her, nor is it possible to render honour worthy of her, (Tone 4) for her excellence surpasses all understanding.” (Tone 8) Therefore, immaculate Theotokos, who livest forever with thy Son, the life-bearing King, pray ceaselessly to Him to preserve the new people of God, and to save them from every hostile assault, for we have acquired thine intercession, (Tone 1) and to the ages, in manifest splendor, we call thee blessed. Jacob went out from the well of the oath and journeyed towards Harran. And he lighted on a place and slept there, for the sun had set. And he took one of the stones of the place and put it at his head; and he slept in that place, and he dreamed. And behold, a ladder set up on the earth, whose head reached to heaven; and the Angels of God were going up and going down upon it. But the Lord stood above it and said: ‘I am the God of Abraham, your father, and the God of Isaac, do not be afraid. The land on which you are sleeping I shall give to you and to your seed. And your seed will be like the sand of the earth, and it will be spread abroad to the Sea and Liva and North and East; and in you and in your seed all the tribes of the earth will be blessed. And behold, I am with you, guarding you on every road on which you may journey; and I shall bring you back again to this land, because I shall never abandon you until I have done all that I have said to you’. And Jacob arose from his sleep and said: ‘The Lord is in this place, but I did not know it’. And he was afraid, and said: ‘How fearful is this place! This is none other than the house of God, this is the gate of heaven’. ‘It shall be from the eighth day and upwards, the Priests shall make your holocausts upon the altar, and those for your salvation; and I shall accept you’, says the Lord. And he turned me back by the way of the outer gate of the Holy Place, which looks towards the east, and it was shut. And the Lord said to me: ‘This gate shall be shut, it shall not be opened, and no one shall pass through it, because the Lord, the God of Israel, will enter through it, and it shall be shut. Therefore this prince shall sit in it to eat bread. By the way of the Elam of the gate he shall enter, and by that way he shall go out’. And he brought me by the way of the gate towards the North, opposite the House; and I saw, and behold the whole house of the Lord was full of glory. Wisdom has built herself a house. She has slaughtered her beasts and mixed her wine in the mixing bowl, and prepared her table. She her sent out her servants, to invite with a loud proclamation upon the mixing bowl: ‘Whoever is foolish, let him turn to me’. And to those who lack wisdom she said: ‘Come, eat my bread, and drink the wine that I have mixed for you. Abandon folly, and you will live; and seek understanding that you may have life, and set aright your understanding with knowledge. One who corrects the wicked will gain dishonour for himself. One who rebukes the impious will get blame for himself; for to the impious rebukes are blows. Do not rebuke the wicked, lest they hate you. Rebuke a wise man and he will love you. Give instruction to a wise man and he will be wiser; teach a just man and he will increase learning. The beginning of wisdom is the fear of the Lord, and the counsel of Saints, understanding. While to know the law is the part of a good mind. For by this means you will live for a long time, and years will be added to your life’. but also to the translation of her who gave Him birth. We also venerate her, for she doth pray for our souls. With her all things are filled with joy, and she bestoweth great mercy on us. today delivers her blameless soul to her Creator and her God. the salvation of the faithful and hope of our souls. into the hands of her Son! together with the Angels and the Apostles. come, let us form a choir! Come, let us garland the Church with songs, as the Ark of God goes to her rest! as it receives the Mother of Him Who cannot be contained. The earth, as it yields up the source of Life, is robed in blessing and majesty. now that she is translated from life to life. into the hands of Him Who became incarnate of her without seed. to grant the earth peace and great mercy. Come, ye peoples, let us sing the praises of the pure, all-holy Virgin, from whom the Word of the Father came forth ineffably incarnate, as we cry and say: Blessed art thou among women! Blessed is the womb which contained Christ! As thou deliverest thy soul into His holy hands, intercede, O Immaculate One, that our souls may be saved. v. Arise, O Lord, to Thy rest; Thou and the Ark of Thy sanctification. The multitudes of Angels in heaven and we the human race on earth call thine all-revered falling asleep blessed, O pure and all-holy Virgin; because thou becamest Mother of the Maker of all things, Christ God. Cease not to intercede with Him, we beg, for us who next to God place our hopes in thee, O Mother of God, all-praised and who did not know wedlock. v. The Lord hath sworn in truth to David, and will not annul it: Of the fruit of thy womb I will place on thy throne. Ye peoples, let us sing David’s song today to Christ God: ‘Virgins, he says, will be brought after her to the King, they will be brought in joy and gladness’. For she, who is from the seed of David and through whom we have been made divine, passes over in glory and beyond reason into the hands of her own Son and Master. As we sing her praise as Mother of God we cry out and say: ‘Save us who confess thee, O Mother of God, from every disaster, and from dangers rescue our souls’. and the whole sacred choir of the Apostles. the source of Life, which had received God. In giving birth , O Mother of God, thou hast preserved thy virginity, And in falling asleep thou hast not forsaken the world. Thou who art the Mother of Life wast translated unto life; by thy prayers deliver our souls from death! If the service of the Burial of the Mother of God is being incorporated into the All-Night Vigil, the kathisma readings and sessional hymns below are not said; instead, we move directly from 'The Lord is God...' to the hymns of the Mother of God that form the beginning of the Lamentations, and perform the lamentations in place of the polyeleos. Those texts and further instructions are found here. The all-honoured choir of the wise Apostles was wondrously assembled to bury with glory thine immaculate body, O all-praised Mother of God. With them the multitudes of Angels also didst raise their song as they reverently praised thy Translation, which we celebrate with faith. I will remember thy name from generation to generation. v. Listen, O daughter, see and incline thine ear; and forget thy people and thy father’s house. Then, Let everything that has breath. At the prayers of the Mother of God, O Merciful, wipe out the multitude of my transgressions. Have mercy on me, O God, according to Thy great mercy; and according to the multitude of Thy compassions wipe away mine offence. When the Translation of thine immaculate body was being prepared, the Apostles surrounded thy deathbed and looked on thee with dread. And as they gazed at thy body they were seized with awe, while Peter cried out to thee with tears: ‘Immaculate Virgin, I see thee, who art the life of all, lying here outstretched, and I am struck with wonder; for in thee the Delight of the life to come made His dwelling. But fervently implore thy Son and God that thy City may be kept safe from harm’. Then two Canons are sung: the first in Tone 1, with the Irmoi, to 8; and the second in Tone 4, with the Irmoi, to 6. Finally the Irmoi again as Katavsiae. Of which the Acrostic is ‘Let the godly minded keep festival’. A Composition by Kyr Kosmas. Irmos. Thy sacred and renowned memorial, embroidered, O Virgin, with divine glory, hath brought all the faithful together for joy; and led by Miriam with dances and timbrels, they sing to thine Only-begotten Son, for He hath been glorified. A host of the immaterial dwellers in heaven didst attend thy godlike body in Sion; while suddenly the multitude of the Apostles, coming together from the ends of the earth, stood beside thee all at once, O Mother of God; with them, immaculate Virgin, we glorify thine august memory. Thou hast carried off prizes of victory against nature, Pure Virgin, in bearing God; yet, imitating thy Maker and Son, beyond nature thou dost submit to nature’s laws; and so dying, thou dost rise with thy Son and live forever. Irmos. I will open my mouth and it will be filled with the Spirit, and I will utter a word for the Queen and Mother, and I will be seen keeping glad festival, and rejoicing I will hymn her falling asleep. Young virgin maidens with Miriam the Prophetess, now raise the song of departure; for the Virgin and only Mother of God is being taken over to her appointed place in heaven. The divine tabernacles of heaven fittingly received thee as a living heaven, all-pure Virgin; and as a blameless bride thou standest radiantly adorned before thy King and God. Irmos. O Christ, the Wisdom and Power of God, which creates and upholds all, establish the Church unshaken and unwavering; for Thou alone are holy, whose resting place is among the Saints. Knowing thee, All-blameless, to be a mortal woman yet beyond nature Mother of God, with fearful hands the illustrious Apostles touched thee, as thou didst blaze with glory, gazing on thee as the Tabernacle that had received God. Just punishment intervened to cut off the sacrilegious hands of the presumptuous, for God guarded with the glory of the godhead the reverence due to the living Ark, in which the Word had become flesh. Irmos. O Mother of God, as a living and unstinted fount, establish those united in spiritual fellowship who sing thee hymns of praise, and in thy divine glory grant them crowns of glory. Pure Virgin, sprung from mortal loins, thy final departure was in conformity with nature; but, as thou gavest birth to the true Life, thou hast passed over to the One who is the divine Life in person. A company of Theologians from the ends of the earth and a multitude of Angels hastened to Sion at an all-powerful command, that they might fittingly minister at thy burial, O Sovereign Lady. Irmos. The sayings and riddles of the Prophets foreshadowed Thine incarnation from a Virgin, O Christ, even the brightness of Thy lightning, which would come as a light for the nations; and the deep calls to Thee with joy: Glory to Thy power, O Lover of mankind. See, ye peoples, and marvel; for the holy and most manifest mountain of God is being lifted up far above the hills of heaven, as the earthly heaven makes her dwelling in a heavenly and incorruptible land. Death has become for thee, pure Virgin, a crossing to an eternal and better life, translating thee from one which perishes to one which is truly divine and without change, to gaze in joy upon thy Son and Lord. The gates of heaven were lifted up, the Angels sang in praise and Christ received the virgin treasure of His own Mother. Cherubim withdrew before thee with gladness and Seraphim glorify thee with joy. Irmos. The prophet Avvakoum, perceiving the unsearchable divine counsel of Thine incarnation from the Virgin, O Most High, cried out: Glory to Thy power, O Lord! Strange marvel it was to see the living heaven of the universal King going down below the hollows of the earth. How wonderful are Thy works! Glory to Thy power, O Lord! At thy Translation, O Mother of God, the hosts of Angels in fear and joy covered with hallowed wings thy body that had been spacious enough to receive God. If her fruit, Who is beyond understanding, because of Whom she was called Heaven, willingly underwent burial as a mortal, how will she refuse burial, who bore Him without wedlock? Irmos. I shall expound the divine and ineffable beauty of Thy virtues, O Christ; for Thou hast shone out from the eternal glory as the empersonned and eternal Brightness; and taking flesh, and incarnate from a virgin womb for those in darkness and in shadow, Thou didst dawn as the sun. Riding as though upon a cloud, the company of the Apostles was being gathered to Sion from the ends of the earth to minister, O Virgin, to thee, the light cloud, from which God the Most High, the Sun of righteousness had shone for those in darkness. Irmos. The universe was amazed at thy divine glory, for thou, O Virgin, who didst not know wedlock, hast passed over from earth to eternal mansions and to life without end, as thou givest salvation as the prize to all who sing thy praise. Let the trumpets of the Theologians ring out today, and let the human tongue now sound praises with many voices! Let the air re-echo, shining with infinite light! Let Angels honour with hymns the Falling Asleep of the Virgin! The vessel of election, wholly beside himself, wholly transported, surpassed himself in hymns to thee, O Virgin; wholly consecrated to God, he truly was and proved himself to all to be possessed by God, O all-praised Mother of God. The Sovereign and God of all apportions to thee things above nature; for just as He hast kept thee Virgin in thy giving birth, so He hast preserved thy body incorrupt in the tomb; and He hast glorified thee with Him by a divine Translation, gracing thee with honours, as a Son His Mother. Thine Offspring, O Virgin, hath truly made thee to dwell in the Holy of Holies as shining lampstand of the immaterial fire, golden censer of the divine coal, jar and rod and tablet written by God, holy Ark and Table of the bread of life. Irmos. As we celebrate this divine and honoured feast of the Mother of God, come, godly-minded people, let us clap our hands as we glorify God who was born of her. Life dawned from thee without loosing the keys of thy virginity. How then hast thy spotless tabernacle, source of Life, become a partaker in the experience of death? Once the sacred enclosure of Life, thou hast found eternal life; for through death thou, who gavest birth to Life in person, hast passed over to life. Neither tomb nor death overpowered the Mother of God, unsleeping in her prayers, unfailing hope in intercession; for as Mother of Life she hath been taken over into life by Him who dwelt in her ever-virgin womb. Set a rampart about my mind, my Saviour, for I dare to sing the praise of the rampart of the world, Thine all-pure Mother. Strengthen me in the tower of my words and fortify my in the turrets of my thoughts. For Thou criest out that Thou fulfillest the requests of those who ask in faith. Grant me therefore tongue, utterance and thought without shame. For every gift of enlightenment is sent down from Thee, the Giver of light, who dwelt in her ever-virgin womb. On the 15th of the month, we commemorate of the all-revered Dormition and Translation of our most glorious Lady and ever-virgin Mary. When the world’s Fashioner in the flesh had died. God’s Mother ever lives, though on the fifteenth she died. When Christ our God was well pleased to take to Himself his own Mother, three days prior he told her through an Angel of her translation from the earth. ‘It is the moment’, he said, ‘to take my Mother to myself. Do not then be any way troubled by this, but accept my word with joy, for thou art coming to immortal life.’ And she, in her longing for her translation to her Son, went up the mount of Olives with haste to pray (for it was her custom to go up there to pray). Then there took place a marvel: for the plants on the mount bowed themselves down of their own accord and, like living slaves, accomplished fitting reverence to their Lady. After her prayer she returned home and at once the whole house was shaken. She prepared many lights and having given thanks to God she invited her relatives and neighbours. She swept the house and prepared the couch and everything needed for the burial. She explained everything which had been told her by the Angel about her translation to heaven and as confirmation of her words showed the reward that had been given her, which was a palm branch [from Paradise]. But the women who had been summoned on hearing this poured out lamentations and tears and lamented with cries of grief. When they ceased their lament they begged her not to leave them orphans. She assured them that when she had passed over she would watch over and protect not only them but the whole world. Much of their grief was assuaged by these words of consolation which she spoke to the bystanders. Then she gave instructions about her two tunics, that the two poor widows who were customarily with her and known to her and who received from her what was required for their nourishment should take one each. When these things had been completed, Paul the inspired vessel of election arrived. He fell at the feet of God’s Mother, worshipped and opening his mouth uttered a great eulogy of her, saying: ‘Hail, Mother of life and subject of my preaching. For though I never saw Christ, in seeing you I seem to see Him.’ Then the Virgin took leave of all. She lay down on the bed and arranged her all-pure body as she wished. She prayed for the conservation of the world and for peaceful life. She filled them too with blessings through her, and so committed her spirit into the hands of her own Son and God. At this Peter began the funeral hymns. The rest of the Apostles took up the bier and accompanied the body that had received God to the grave, some going in front with lamps and hymns, others following behind. At this the rulers of the Jews stirring up some of the crowd persuaded them to try to upset the bier on which the life-giving body had been placed and to throw it to the ground. But already punishment came upon those who dared such things, and they were all smitten with blindness. One of them, who attempting even greater folly had touched the sacred bier, was deprived of both his insolent hands. They were severed by the sword of punishment and left hanging from the bier. He remained a pitiable sight until, after he had come to belief with his whole heart and found healing, he was restored to health as before. So too part of the covering of the bier, when placed on those who had been blinded and come to belief, gave them healing. When the Apostles reached Gethsemane they laid the live-giving body in the grave and remained there for three days responding to the unceasing voices of the Angels. 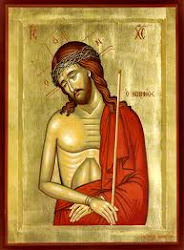 But when, by divine dispensation, one of the Apostles [St Thomas], who had been absent from the burial of the life-giving body, arrived on the third day, he was greatly grieved and distressed that he had not been found worthy of what they had. All his fellow Apostles, who had been found worthy, by a common vote opened the tomb for the sake of the Apostle who had been absent, so it seemed good to all, for him also to venerate that all-blameless body. When they looked they were amazed. For they found it empty of the holy body, and containing only the winding sheet, which remained as a consolation for those who were about to grieve and for all the faithful, and as a sure witness of the Translation. For even until today the tomb hewn from the rock is visible and venerated, and remains empty of a body, to the glory and honour of our most blessed Lady, Mother of God and ever-virgin Mary. At whose holy intercessions, O God, have mercy and save us, as Thou art good and love mankind. Irmos. Fighting against cruel wrath and fire, love divine quenched the fire with dew, and laughed the wrath to scorn, making the three-stringed lyre of the Saints, inspired by God, sing in the midst of the flame, in answer to the instruments of music: Blessed art Thou, most glorious God, our God and the God of our fathers. In wrath Moses smashed the tablets made by God, written by the divine Spirit; but his Master, having kept her who gave Him birth unharmed for heavenly abodes, hath now made her dwell in them. As with her we leap for joy, we cry to Christ: Blessed art Thou, most glorious God, our God and the God of our fathers. With cymbals of pure lips and the harmonious harp of the heart, with the well-sounding trumpet of an uplifted mind, as we clap with active hands, we cry on this auspicious and chosen day of the translation of the pure Virgin: Blessed art Thou, most glorious God, our God and the God of our fathers. The people inspired by God has gathered; for the Tabernacle of God’s glory is being translated in Sion to a heavenly abode, where there is the pure sound of those who feast, the voice of ineffable joy of those who cry with gladness to Christ: Blessed art Thou, most glorious God, our God and the God of our fathers. Irmos. The godlike Youths did not worship creation instead of the Creator, but bravely trampling on the threat of fire, rejoicing they sang: O highly exalted Lord and God of our fathers, blessed art Thou! Young men and maidens, old men and rulers, kings with judges, as you honour the memory of the Virgin and Mother of God, sing out: Lord and God of our fathers, blessed art Thou! Let the mountains of heaven resound with the trumpet of the Spirit; let hills now rejoice, and let the godlike Apostles leap for joy: the Queen is being translated to her Son, with Whom she rules forever. The most sacred Translation of Thy godlike and undefiled Mother hath gathered the celestial ranks of the Powers on high to rejoice together with those on earth who sing to Thee: O God, blessed art Thou! Irmos. The all-powerful Angel of God revealed to the Youths a flame that brought refreshment to the Holy, but consumed the ungodly; while he made the Mother of God a spring, source of life, gushing forth the destruction of death, but life for those who sing: We who have been delivered praise the only Creator, and highly exalt Him to all the ages. Irmos. The Offspring of the Mother of God saved the innocent Youths in the furnace. Then He was prefigured, but now in reality He dost gather the whole world which sings: All ye works, praise the Lord, and highly exalt Him to all the ages. Immaculate Virgin, Rulers and Dominions with Powers, Angels, Archangels, Thrones, Principalities, the Cherubim and the dread Seraphim glorify thy memory; while we, the human race, praise and highly exalt thee to all ages. He, who when taking flesh made His dwelling strangely in thine immaculate womb, Himself received thine all-holy spirit and, as a dutiful Son, gave it rest with Himself. And so we praise thee, O Virgin, and exalt thee above all to all ages. Irmos. In thee, O Virgin without spot, the bounds of nature have been overcome; for childbirth remains virgin, and death is betrothed to life; Virgin after bearing child, and alive after death, O Mother of God, may thou ever save thine inheritance. All generations call thee blessed, the only Mother of God. The angelic Powers were amazed as they looked in Sion on their own Master bearing in His hands the soul of a woman; for as befitted a Son He didst say to the one who gavest Him birth without spot: Come, honoured Lady, be glorified with thy Son and God. The choir of the Apostles shrouded thy Body, which had received God, as they looked with awe and addressed thee with clear voice: As thou departest into heavenly bridal chambers to thy Son, may thou ever save thine inheritance. Angels, when they saw the falling Asleep of the Virgin, were amazed at how the Virgin went up from earth to the things on high. Come now, on Sion, the divine and fertile mountain of the living God, let us be glad as we gaze on the Mother of God. For as His Mother, Christ translates her to a far better and more divine tabernacle, the Holy of Holies. Come, you faithful, let us approach the tomb of the Mother of God, and let us embrace it, touching it sincerely with the lips, eyes and brows of the heart; and let us draw abundant gifts of healings, which flow from an ever-flowing fount. Receive from us this burial hymn, O Mother of the living God; and overshadow us with thy light-bearing and divine grace. Grant victories to our rulers, peace to the people that lovest Christ, and to us who sing forgiveness and salvation of our souls. At Lauds we insert 6 stichera and sing Prosomia, doubling the first. At thy glorious Falling Asleep the heavens rejoice and the armies of Angels exult; the whole earth is glad as it utters its funeral hymn to thee, Mother of the Master of all things, all-holy Virgin, who knewest not wedlock, who hast delivered the human race from the ancestral sentence. Virgin Mother, Bride of God, who gavest birth to life, thou hast passed over to immortal life by thy revered Falling Asleep. Angels, Rulers and Powers, Apostles, Prophets and all creation escorted thee, and thy Son received in his immaculate hands thine unblemished soul. At thine immortal Falling Asleep, O Mother of God, Mother of life, clouds caught the Apostles up into the air; and though they were scattered through the world, made them form a single choir in the presence of thine immaculate body. As they reverently buried thee they sang Gabriel’s song, crying out: ‘Hail, full of grace, Virgin Mother without bridegroom, the Lord is with thee!’ With them implore Him as thy Son and our God that our souls may be saved. 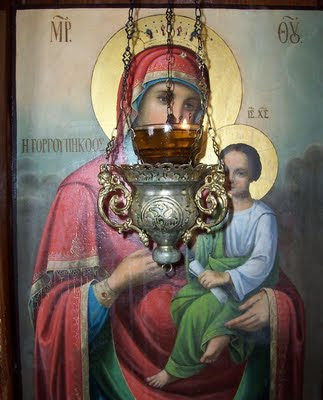 Holy oil is also given to the brethren. The Typika, and with the Beatitudes troparia from the canons of the feast, Odes 3 and 6. My soul doth magnify the Lord, and my spirit rejoiceth in God my Saviour. Megalynarion: Angels, when they saw the falling Asleep of the Virgin, were amazed at how the Virgin went up from earth to the things on high. Irmos: In thee, O Virgin without spot, the bounds of nature have been overcome; for childbirth remains virgin, and death is betrothed to life; Virgin after bearing child, and alive after death, O Mother of God, may thou ever save thine inheritance. I will receive the cup of salvation and call on the name of the Lord. Αναρτήθηκε από amphilochios στις 6:01 μ.μ.